Lebbeus Woods, Architect is on view at SFMOMA till June 2. Open Space is pleased to be hosting a series of posts on Woods’s work and legacy. Today, please welcome SFMOMA’s architecture and design department assistant Daryl McCurdy. In 1960, a 20-year-old Lebbeus Woods arrived at the University of Illinois at Urbana-Champaign to pursue a master’s degree in architecture. Already a highly skilled draftsman, Woods began to offer his illustration skills to scholars for their academic papers. One of Woods’s clients was Dr. Heinz von Foerster, a Viennese-born physicist, mathematician, philosopher, magician, and creator of second-order cybernetics. The little-known connection between these two men, documented in letters now held in the University of Illinois Archives, suggests intriguing correspondences between the careers of the experimental architect and the pioneer of cybernetics. Lebbeus Woods’ business card,1970. Image courtesy of the University of Illinois at Urbana-Champaign Archives. 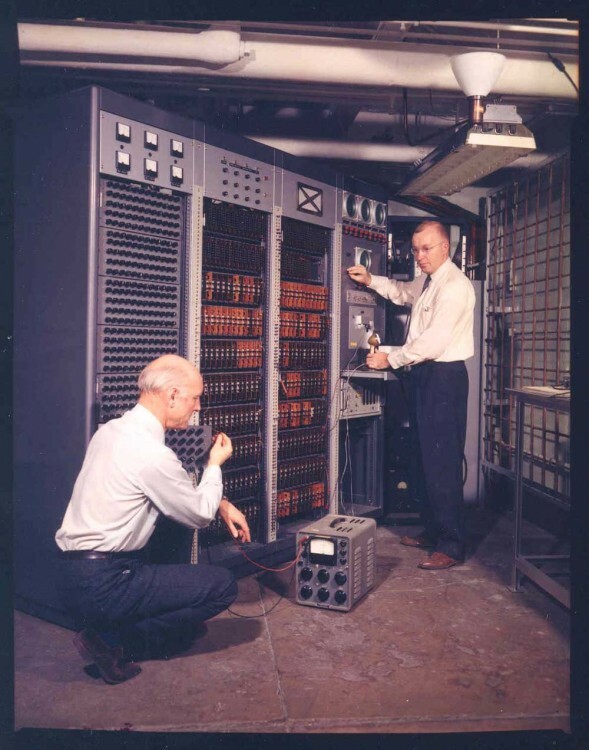 In 1958, von Foerster founded the Biological Computer Laboratory (BCL) at UIUC, with support from the Office of Naval Research. 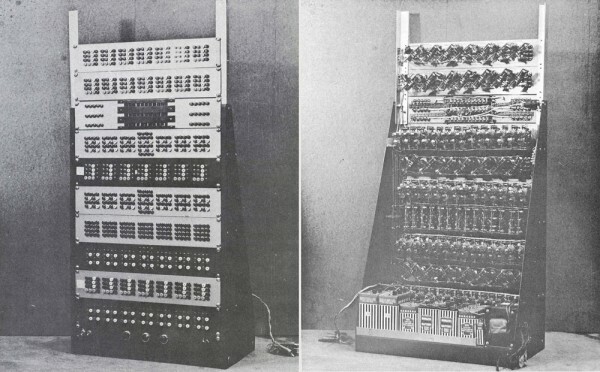 Between 1958 and 1975, von Foerster and the BCL self-published hundreds of publications; attracted leading minds in the sciences, humanities, and arts; and produced a number of machines that are among the earliest parallel computers. A venerable cybernetics think tank, the BCL took on the understanding of systems theory, and specifically self-organizing systems, with a disregard for disciplinary boundaries and a zeal for tough epistemological questions. Characteristic of the cybernetics movement of the 1960s, the BCL operated largely in a theoretical space, without concern for conventional research practices and practical solutions. Perhaps most illustrative of this approach were the “machines” developed at the BCL as part of its research on self-organizing systems. Aided by bright graduate students, such as Murray Lewis Babcock (pictured below), von Foerster developed machines modeled on natural phenomena. Building on neurophysiology, the Adaptive Reorganizing Automaton (1960) was made up of a series of interconnected components that would “evolve” certain patterns of behavior as information (i.e., signal energy) passed through its self-contained system. As an instrument, it did not measure or accomplish anything; instead, it can be seen as a metaphor for or illustration of von Foerster’s ideas on the self-organizing system, or as a step toward a better understanding systems theory. Though the work of von Foerster and the BCL can be cited as a precursor to current efforts in bioengineering, cognitive science, art, technology, and artificial intelligence, the field of cybernetics and the BCL have since been eclipsed by fields yielding more direct applications and commercial potential. In 1975, following the Pentagon’s 1970 decision to limit military spending to projects bearing directly on military operations, von Foerster succumbed to the BCL’s hopeless financial situation and retired to California. Von Foerster (left) and Babcock demonstrate the dynamic signal analyzer. 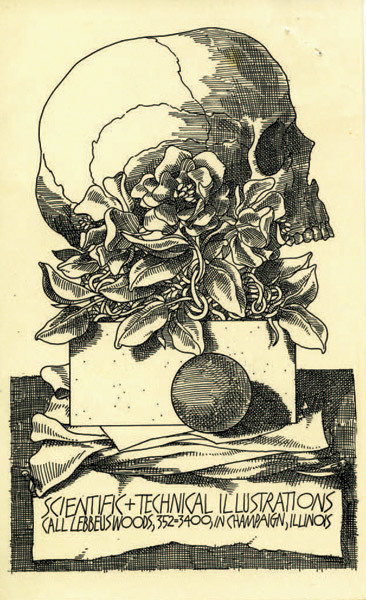 Image courtesy of the University of Illinois at Urbana-Champaign Archives. 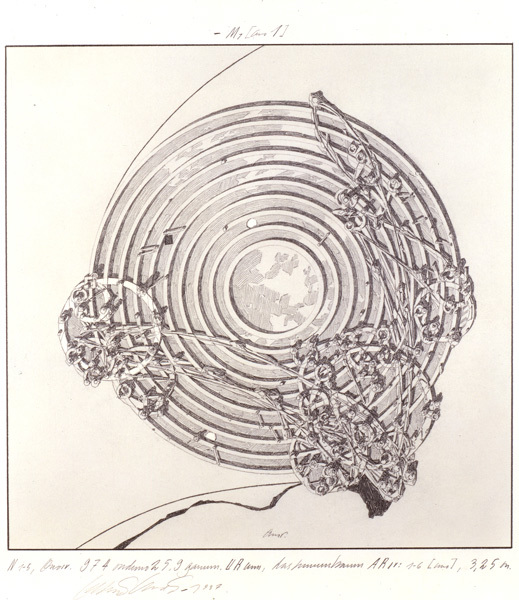 In the 60s we had a working relationship, as [von Foerster] asked me to make illustrations for several of his scientific papers, which meant that he had to explain to me his ideas, which he did with remarkable simplicity and clarity. I learned a lot in our conversations, and it has echoed down through the years in my work. Heinz always called me an “epistemologist,” a high compliment coming from him. From time to time, I would send him publications of my projects and he would always comment. Under the leadership of Woods, [Andreas, Lebbeus, and two of their colleagues] aimed at exposing traditional teaching of architecture as being shallow, irrelevant and commercial. In contrast, however, to the standard mode of expressing dissatisfaction with academic procedures and standards by impeding this process, they chose to demonstrate the alleged deficiency by working twice as hard. To almost all problems and projects which were part of the curriculum, they delivered two or more solutions. One was the “required one” which fulfilled the posted conditions, the others were their reinterpretations of the project, produced in cooperation or individually. . . . I have for Woods the deepest respect for his uncompromising attitude to be true to himself. . . . It is his relentless search for truth and for the syntax of his self-expression that persuaded me to submit his name to the Foundation as a potential fellow. It is tempting to try to piece together a narrative of Woods and von Foerster’s relationship and to trace threads of influence throughout Woods’s prolific later career. Indeed, both men held a common concern for difficult questions of epistemology, the agency of the observer, and the organization of systems. They both applied unrelenting creativity and a disregard for predetermined boundaries to the advancement and exploration of their respective fields. 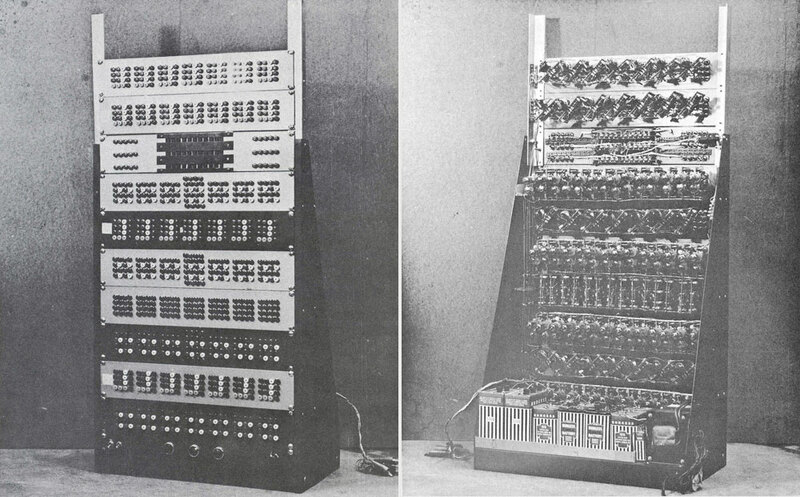 Front (left) and back views of Babcock’s adaptive reorganizing automaton. Image courtesy of the University of Illinois at Urbana-Champaign Archives. However, perhaps the most potent issue to consider is that of legacy. How do we remember a career that did not leave behind a canonical trail? How do we fit the machine designed to illustrate a philosophical idea into a history of computing, or fit the plans for a city that can exist only in the imagination into a history of architecture? Von Foerster and Woods’s greatest accomplishments came in the form of ideas and spirit, of metaphors and what-ifs. Thank you to my former UIUC professor Kevin Hamilton, who has made several projects about the BCL and who helped guide my research. Daryl McCurdy is architecture and design department assistant at SFMOMA.